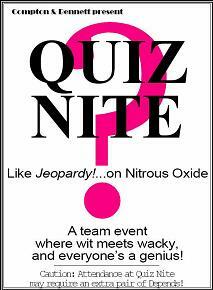 Our Quiz Nite is about an hour and a half of fun questions designed to both challenge and entertain. Typically it begins when dessert is served. There are three themed categories of ten-questions each and one fifteen-question category of General Knowledge. Each table of 4 to 8-people works together as a team, creating a series of dynamics within the audience. Each question is read by us and one answer is agreed upon by each team. When ten questions have been read and answered, the teams exchange papers and the answers revealed. At the end of the evening, a winner is announced and a small prize awarded. But this event is not about winning or losing, it's about the hilarity along the way. We provide the quiz sheets, pens and (if it is not easy for our mics to plug into your house system) a PA system. You provide the 5 prizes, none valued at more than $50. Often these are bottles of wine. Our Quiz Nites ran weekly to sold-out crowds for two years at The English Pub in Naples. Our Quiz Nite questions were featured at the annual New York Times Crossword Puzzle Tournament's Friday Night entertainment.